Maybe Scientists don't make the best science fiction advisers after all. Call me a purist. Call me an old fogie. Call me anything you want, but don't call classic science fiction "Roddenberrian nonsense." For some inexplicable reason, that's what Battle Star Galactica producer Ronald Moore thinks of classic Star Trek. It also finally makes it clear to me why I HATED Star Trek Voyager, which Moore also wrote for. Great, terrific, outstanding, if you're making a movie about the present or near future. By 'near future', I mean the next twenty years or less. If you're looking out any farther than that, then you're gonna have to bend, stretch, or outright break what we think of as conventional science. Consider how completely alien our world would seem to someone from 1900. We have jumbo jets, computer piloted trains, tiny portable phones, giant flat-screen TVS, and countless other things they could hardly imagine. If movie producers had followed Moore's approach in making science fiction in the old days, Buck Rogers would have talked on a land line phone, fired bullets rather than lasers rayguns, and traveled mostly by horse cart or Model A Ford. In other words, Buck would have been a cowboy instead of a space traveler. 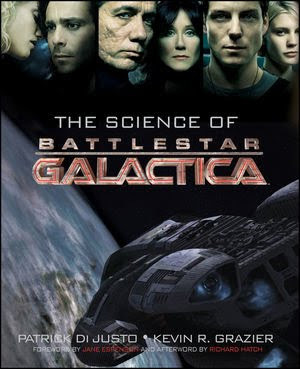 The upcoming series Battlestar Galactica: Blood & Chrome apparently is supposed to take place in the distant future, but Grazier's job is to make sure none of the science and tech in it is too different from modern stuff. That's absurd because, at the rate that things are changing these days, I suspect that the technology we'll be using by the time I retire will be more alien than the stuff of BSG:B&C. Now, I'm not saying that we can ever hope to accurately predict what things will be like in the distant future. But I firmly believe that fans of science fiction want more than Moore is willing to give us. I'm also convinced that the weird science and tech, that Moore felt weighed down Star Trek, is precisely the sort of thing that inspires people to study science and stimulates the imaginations and hopes of everyone who watches futuristic shows and movies. Come on Moore, lighten up, use your imagination to stimulate ours. And don't let Grazier throw cold water on visionary fiction just because modern science can't explain/understand/predict it. When I watched BSG I thought it's just like being on an aircraft carrier in space. A day or so ago I saw Grazier in an interview, and he said that was the inspiration. How lame. Lead bullets..really. Also they shot missiles with explosive warheads, these won't actually work as there is no shockwave due to the lack of atmosphere. The original BSG from (OMG!) 30 years still looks more futuristic than this one. Well, it could be than you are not trying to fire an exploding warhead ON a sheet of metal in vacuum, but trying to punch a hole into it using an armor piercing head and delivering an explosive payload inside a metal bucket filled with air in space. That would be really effective, I guess ! Did anybody who posted here actually WATCH the show or read the book? Or simply just not pay attention? The series takes place 150,000 years ago, not the far distant future. Since it's a prequel, you might also assume that "Blood and Chrome" is also 150,000+ years ago. The "retro" look/feel is explained in the pilot episode of the series -- in the first 10 minutes. Leaping Lizards? No. Flying Snakes! Airport Body Scanners: To Fear or Not to Fear? Who Says Hands Need Five Fingers?